I'm looking for examples of incidents where photographers/newspapers/photojournalists altered photos (e.g., the Reuters Smoke incident of '06). Help? I need to write a paper for a class. I'd like it to be on photoshop in the media, namely any controversy over the use thereof, but I'm unsure of whether or not there are enough examples for me to use. I have LexisNexis at my disposal, but the search results (usually hovering at about 1000) are overwhelming. Any prior incidents that you could enlighten me about would be wonderful. OJ on the cover of Time (skin darkened). The McCaughey family in Time (mother's teeth fixed). Early in Iraq War II, there was a widely-discussed photo that was actually a composite of two photos. Can't remember much more about it than that. Bush holding My Pet Goat upside-down (this was not in the press AFAIK, but it was widely circulated). There are more frequent instances of photos being staged than there are of them being digitally altered. Pretty much every photo spread shown after an Israeli strike in Gaza shows at least one miraculously saved or tragically burned koran right in the middle of a perfect composition. I think there was a recent incident like this in the Chinese press. Here's an article from Hong Kong, and another from Shanghaiist. The best page I've seen is Photo Tampering Throughout History. However, it seems to be down right now [google cache sans images]. Digital Forensics, An Interview with Dr. Hany Farid is an interview with the guy responsible for the aforementioned page. Woops! I'm sorry, I totally forgot to clarify that I'm looking for examples in American/Western media (ethnocentrism strikes again!). But hey, y'know, if you've got good examples from other countries, why the hell not? Perhaps I can make comparisons to them. But yes, I am mainly interested in examples from Western, namely American, media. Oprah Winfrey with Ann-Margret's body on TV Guide. Here it is being done really badly. This one in particular seems like it might fit your needs. Photo of Condoleezza Rice published on USA TODAY's Web site: Original (altered) photo and the revised USA TODAY article with explanation. For a historical comparison you should check out The Commissar Vanishes: The Falsification of Photographs and Art in Stalin's Russia. Old-school, pre-Photoshop, fascinating. I dunno if it counts as an "incident", but I had an askme about some alterations to film and photos of the titanic, that includes 2 examples, one video and one still. A good keyword for google searches is "fauxtography". Errol Morris (famed documentary filmmaker) wrote an, ahem, extremely lengthy but very interesting article about this subject, with a focus on a famous war photograph from long before Photoshop. Might be interesting to you...and it was even discussed here on mefi. 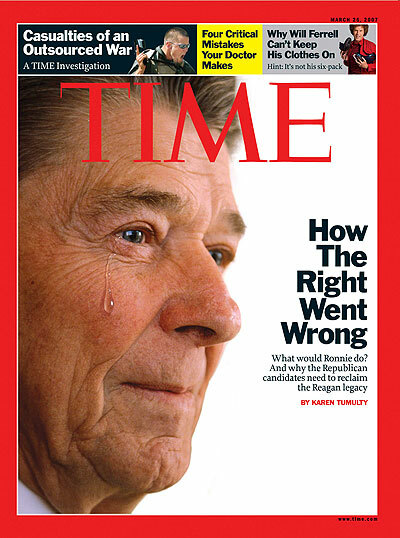 TIME featured a cover last year with a photoshopped picture of Ronald Reagan crying (tear added). It's a fairly transparent attempt at tampering with the original photo, but a tampering nonetheless. We've previously discussed this issue as it relates to the University of Idaho, generating campus diversity through photographic manipulation. The link in that post is dead, but here's one. Apparently U Wisconsin Madison did it, too. Maybe your Lexis/Nexis search can find something about this: I remember reading an article in Time or Newsweek (I think) quite a while back. Maybe even 10 or 15 years. They had run a photo in a previous issue of somebody posing in front of a lion statue. It may have been the New York Public Library. The photographer didn't notice that a little boy was peeking over the statue as the picture was taken. The little boy was removed before the photo ran. I recall the article showed both photos, and discussed what would constitute the fair use of such photo editing. Removing a distracting element like the boy was considered fair, because it wasn't intended to deceive. adamrice is talking about the la times doctored photo. went a googling and found this. Here's a followup from the photographer. Here's an interview with the photographer of this. And this guy, I think he was notorious, if I remember. They found like 84 doctored photos by this dude. I remember when I started taking photographs, I had this (what I thought at the time) brilliant picture of a man and a woman dancing, but you couldn't see her back leg, so I made her one from her front leg. Jeesh. You might want to check the archives of The Digital Journalist online, I believe they've talked about this a lot. Sportsshooter.com is a hub for photojournalists - not just those who shoot sports. A quick search of their discussion forum for "altered photos" turns up a lot of stuff that I think you'll find useful. There's lots more fraud, staging, and photoshopping from the media in regards to Lebanon. Scientology modified some photos they then released to the press, apparently attempting to show more people at an event than were actually there. It was covered in the Washington Post; details are on Arnie Lerma's site (Lerma identified and documented the alterations). Another famous "fixer" photograph was that of Time's 1989 cover photo depicting the fallen Olympic runner Mary Decker with an official bending over her. The official's walkie-talkie had an antenna that seemed to jut out from Decker's chin. The photographer, Tom Bentkowski, who took the photo in 1984, erased the antenna. In 2002, I remember seeing that US Weekly had photoshopped the cigarette out of Britney Spears's hand in this infamous picture - the first shocking! photographic evidence that she smoked - so that they could run it in a spread on boyshorts. Let me tell you, I for one was appalled. Charlotte Observer photographer Patrick Schneider lost an award over photo alterations and then was let go from his job for a digital photo alteration that he claimed was simply restoring the real color of the sky in a photograph. This 1997 Wired article mentions two alterations: one of a photo of Princess Diana and one subtle alteration rearranging the text on the placard worn by the winner of a national spelling bee. The Patrick Schneider case is interesting, because it seems like he didn't do anything that a film photographer wouldn't do by traditional methods in a darkroom. Dodging and burning, increasing contrast and color saturation, are all traditional darkroom techniques that are more easily accomplished in Photoshop. If it's unethical to do such things, then every one of Ansel Adams' photos are unethical fakes. It's true that journalistic photography should be held to a higher standard of "purity" than art or illustrative photography, but how to define purity? What is Pure Photography? is an interesting article with several examples. The "pyramid" http://tech.uk.msn.com/features/gallery.aspx?cp-documentid=7726954&imageindex=3">cover of National Geographic was altered to improve the composition. This essay discusses it and other examples. Boy, I blew that first link. Let's try again. Does anyone remember the faked photo widely distributed by Bushies and other GOPers during the Kerry campaign, the one "showing" him with Jane Fonda at a rally? I can't find it. Anyone have a link, especially a link debunking it? Oh man. This is great. Here I was, thinking there was a dearth of usable material, and then this happens. Thank you all so much! Keep em' coming if you've got more! Oh, I've heard on unreliable places on the internets that 'Death of a Loyalist Soldier' might have been staged. Or, at least, there was much drama on this note. The rumor itself is notable, as I understand this picture is often held out as the first example of embedded/on the front lines photojournalism. Also, it's an awesome photo.